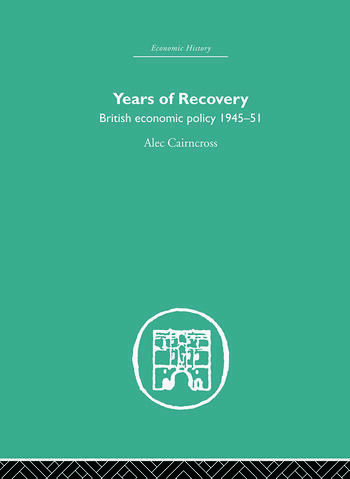 Years of Recovery was the first comprehensive study of the transition from war to peace in the British economy under the Labour government of 1945–51. It includes a full account of the successive crises and turning-points in those hectic years – the coal and convertibility crises of 1947, devaluation in 1949 and rearmament in 1951. These episodes, apart from their dramatic interest, light up the dilemmas of policy and the underlying economic trends and pressures in a country delicately poised between economic disaster and full recovery. Many of the debates on economic policy that are still in progress – on incomes policy, demand management, the welfare state and relations with Europe, for example – have their roots in those years. Many of the trends originating then persisted long afterwards. The book also examines the interaction between events and policy and the role in a managed economy of the policy-making machine. Now that the public records are open to 1954, it has been possible to make use of official documents to review the possibilities of action that were canvassed and the thinking and differences of opinion that underlay ministerial decisions. Combining personal involvement with thorough research, this fascinating study will be a major contribution to our understanding of post-war economic policy. Alec Cairncross was Chancellor of the University of Glasgow and a former Master of St Peter’s College, Oxford. He spent the years covered by this volume as a civil servant in London, Berlin and Paris before moving to Glasgow as Professor of Applied Economics. This classic book of some of his most brilliant research was first published in 1985.